A blow of composition. Fresh and immediate expression from the vortex of creative source. Free from thoughts, sense it, do it. Immagination brought into expression. Step by step through conscious craziness to a final dance. Completely focused on PARTNERING we work on the using the body‘s weight, both our own and the other one. In 4 days we concentrate in every encounter on different aspects. The work grows constantly and embraces the vast complexity of the bond between our being and our doing. Following our instinctive perception for first,at every accomplishment another door opens where we can make a shift into awareness. Weight as support and dynamic motor in shaping a figure. How to modulate muscles in the way in which a figure remains constantly in movement, even at the point of an apparent no return. Being interdependent between the two, that has to do with courage and giving permission to energetic penetration. To bring technique into poetic we motivate expression. Charged by the experience from the last two days we now tap into everyones creative source trying to transform immagination into physical material. By doing so we trascend description in favor of a dynamic narration. We definitely raise the story up into a poetic composition where everything flows together into oneness. The training is open to those who already did some work on any kind of movement: dance, actorˋs activity, martial arts or other disciplnes. There is no special technique required. Be simply ready to tap into the bodyˋs energies and into some unknown parts of you. We introduce a contemporary work on dance which focuses on Partnering. The effort on giving attention to the other while being together and on stimulating a real and sensitive listening among each other is motivated by what appears as a today’s agonizing individualization. We move through a creative process, and on the way to a personal expression we relate to a kind of theme: Humanity and Nature, a visionary yet actual glimpse upon that connection. The research for the physical material is therefore directed from the very beginning towards a certain color of expression. SPRINGE, which means Jump is not to be understood as merely physical jump. It’s that spiritual leap, that real awakening we have to tap in, step by step, jumping into the void. We work 12 hours together and conclude with a performance open to the public of the point we have arrived at. A “dynamic STILL FRAME” of a working process. While working together with the students we create a situation of live-transmission, a teaching by way of participation. This is a very direct condition of exchange like in a artisan’s atelier. 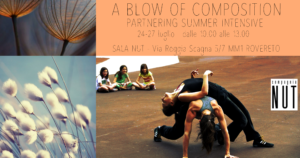 The laboratory is conducted by Barbara Geiger, founder of compagnia NUT and experienced teacher, and assisted by two dancers of the company. The laboratory at Y Generation Festival 2017 “I linguaggi della danza” is part of the company’s much vaster artistic project that embeds the production of a short film entitled VIOLET. Compagnia NUT focuses its physical research on the body’s energy and the way it creates form, expression and empathy between the dancers. Embracing these vital elements, the short film extends therefore the artistic dialogue towards nature and environment. VIOLET moves its imaginary between vision and concrete actuality, with a profound reflection about the deeper relationship between Earth and Human. The sensual speaking of nature gets important dramaturgical sign, overcoming an aesthetic and scenic use: Human’s and Earth’ s tale flow together in a unique frame. The idea to introduce Laboratories to run parallel to the shootings is based on the desire to involve the public, students and interested people. A kind of WORK IN process offers a collective exploration of the usually more intimate researching process of the company.